Comals are large, round, flat clay (or today, metal) griddles. 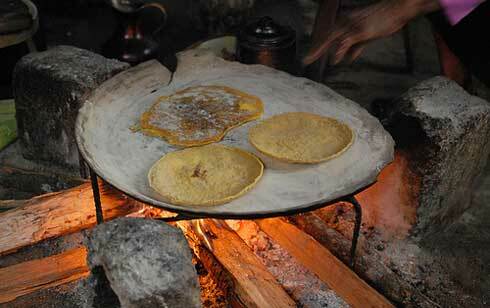 Ethnographic work shows that comals are usually used for cooking tortillas (with occasional double use for toasting coffee or seeds, or reheating tamales). I’ve never come across a description of traditional tortilla production that didn’t involve a comal; there’s no Mesoamerican equivalent of the piki stones found in the US Southwest. The archaeological distribution of comals is highly variable in frequency across time and space in Mesoamerica (Fournier 1998), suggesting that tortillas weren’t nearly as ubiquitous as you might think based on modern Mexican cuisine. 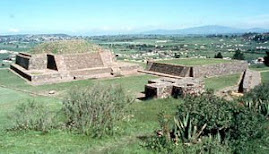 Back during the excavation season in 2007, we had noted that the overall frequency of comals (tortilla griddles) at Calixtlahuaca seemed to be very low, when compared to comparable sites in Morelos or the Basin of Mexico. As our chronological control at the site has improved, this has proved to be both true and false, depending on what phase of the site’s occupation we are looking at. 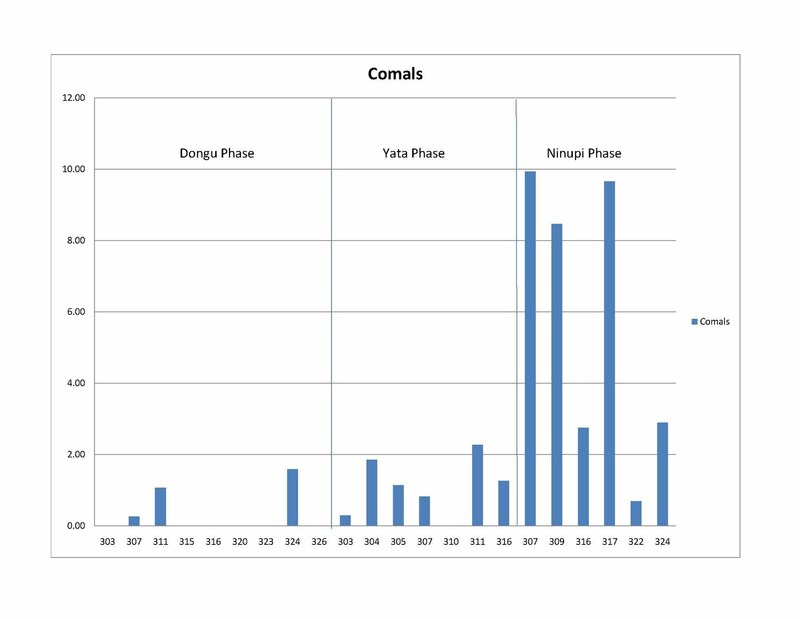 During the Dongu Phase (~1100-1300 CE), only a few contexts had comals, and even when present, the frequencies were very low. 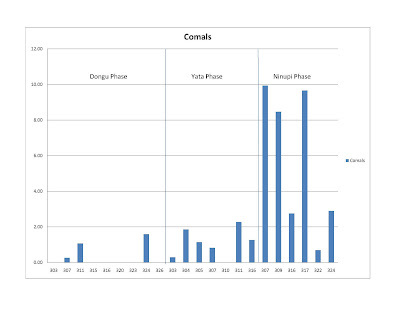 During the subsequent Yata Phase (~1300-1470 CE), the frequency of comals remains low, but the ubiquity goes up, with a few comal sherds present in most contexts. The big change occurs with the shift to the Ninupi phase (~1470-1530 CE). The average frequency of comals rims quintuples, from just over 1% of all rim sherds, to almost 6%. In addition, the distribution of the frequencies is very strongly bimodal, with half of the contexts looking pretty similar to the preceding phases, and half of them looking more like the 7-10% frequencies found in Morelos or the Basin of Mexico. Since the Ninupi Phase approximates the period between the Aztec and Spanish conquests of Calixtlahuaca, the change in comals use raises interesting questions. It suggests that some of the residents of Calixtlahuaca started eating way more tortillas after they became part of the Aztec Empire. 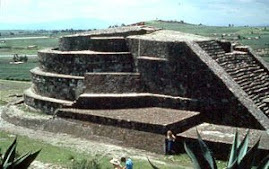 One possibility is that the occupants of these households were interacting with Aztec officials. Eating a meal together served to officially “seal a deal” in Postclassic Mesoamerica (Rodríguez-Alegría 2005), so maybe these households were trying to produce Aztec cuisine for their Aztec business partners. Alternatively, the households with high comal frequencies might belong to immigrants from the Basin of Mexico, who brought their own ways of preparing maize with them to their new homes. 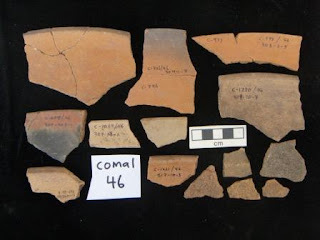 Teasing apart these scenarios will require comparing the changes in comal frequencies to changes in other types of ceramics as well as other artifact types. 1998 El complejo nixtamal/comal/tortilla en Mesoamerica. Boletin de Antropologia Americana 32:13-40. 2005 Eating Like an Indian: Negotiating Social Relations in the Spanish Colonies. Current Anthropology 46:551-574.